In comic books, its proven to be good business to not only create a character to base a series off of but to generate a franchise that can morph into its own entity, something with the ability to generate more desired content and sell more product. Within the last few decades, such an ever-growing entity would be X-Men, which started as a small band of mutants that grew to include an international cast, with members moving on to others areas such as Beast in the Avengers (later, in to the Defenders) and Angel and Iceman in the Champions. 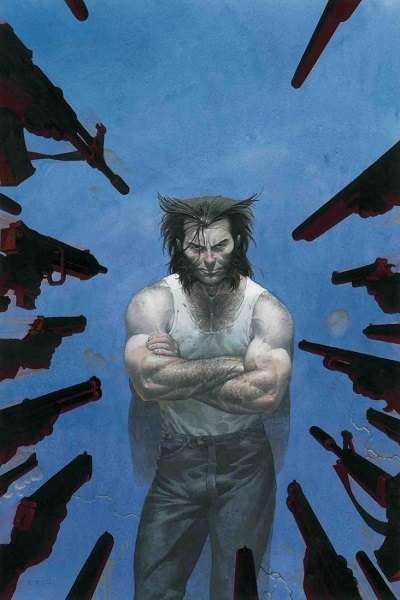 As popularity grew, Wolverine became a breakout star able to support his own title (and subsequently multiple books), the founding members of the group formed their own team in X-Factor, and the franchise blew up into almost its own universe with books like New Mutants, X-Force, X-Statix, Excalibur, Generation X, District X, X-Man, Exiles, NYX, XSE, and so on. However, this level of franchise development pales compared to that of DC Comics where as part of the Silver Age, the publisher largely developed into a series of ever expanding franchises. The king of this, unsurprisingly, is their star character in Superman. 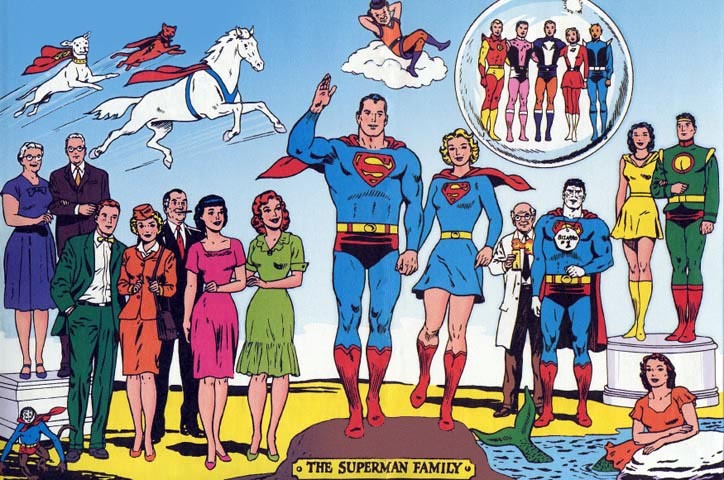 The idea of a Superman Family, Batman Family, etc blew up in the 1970s as titles premiered at DC Comics showcasing characters from the separate franchises. This concept would go to an entirely different level with a proposal Alan Moore drafted for a story called Twilight of the Superheroes. In the story, mankind is ruled by dynasties made up of superheroes and villains, chief among these houses being the House of Steel (for Superman and Wonder Woman’s kin) and the House of Thunder (for the Marvel Family). While the story itself never came to be, its concepts would appear in some form over the years as creators followed similar lines of thought (such as in Kingdom Come where Superman, Batman, and Lex Luthor organized their own organizations that would inevitably battle each other). For Superman, writers would come up with ideas and concepts that because they were attached to such an iconic character would gain notoriety and because of how long Superman has been around, it was only natural for such dynasties to emerge. 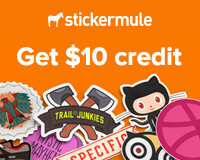 Perhaps the best place to start would be with his villains. Likely the simplest distinction to establish Superman’s foes into separate entities is those of Earth-One and Earth-Two, or the Silver and Golden Age Supermen. For the elder Superman, the hero battled the likes of the Archer, Funnyface, Ultra-Humanite, Tycoon of Crime, Puzzler, Toyman (Winslow Schott), Prankster, Mr. Mxyzptlk, and the red-haired Lex Luthor. Some of these villains would transition to the Earth-One version albeit in different forms, such as another Toyman in Jack Nimball in the 1970s, Mxyzptlk went from a purple suit with green bowtie to a futuristic gold with purple trim outfit, and Luthor became a bald scientist similar to Ultra-Humanite (as the latter would become a white ape). 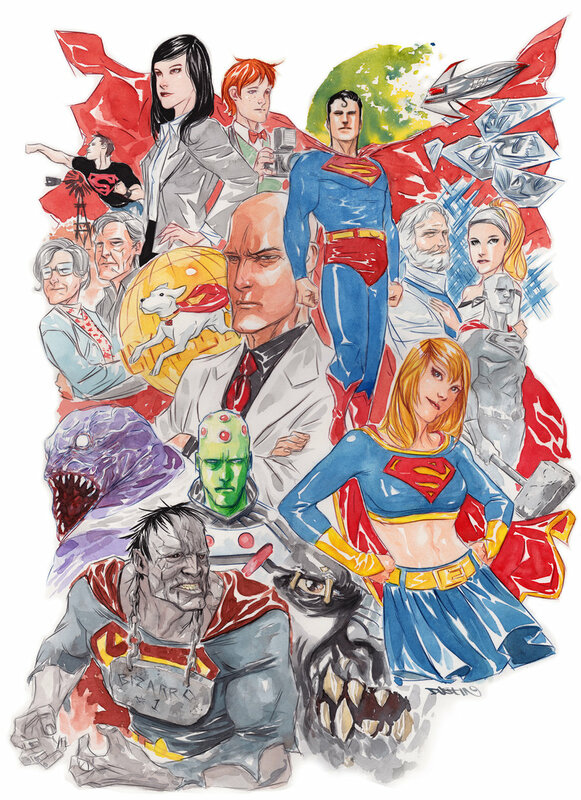 As the Silver Age franchise dove more into science fiction, characters like Brainiac, Bizarro, Metallo, General Zod and the Phantom Zone prisoners, Parasite, Titano, Kryptonite Man, Grax, Terra-Man, Master Jailer, Mongul, Atomic Skull, Lord Satanis, Syrene, Maaldor the Darklord, and Colonel Future emerged. Bizarro himself would branch out, creating a parallel Earth in his image called Bizarro World filled with duplicates of himself and Bizarro-Lois Lanes. Later, it would grow with Bizarro versions of Jimmy Olsen, Perry White, Krypto, Supergirl, Luthor, Joker, and the Justice League of America and their enemies like Amazo and Shaggy Man. 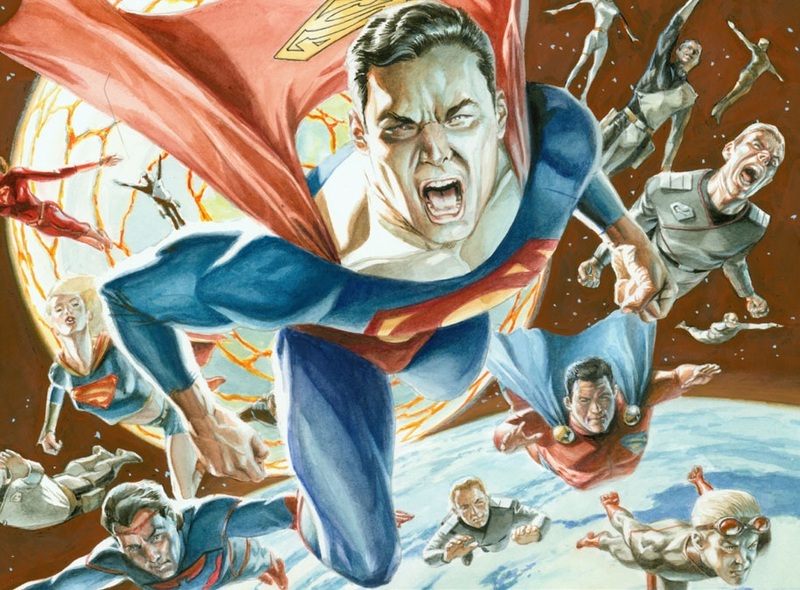 In one story, a future descendant of Bizarro in Bizarro-Superboy would create a Bizarro Legion of Super-Heroes called the Legion of Stupor-Heroes. Following the events of Crisis on Infinite Earths, even more new villains emerged such as Bloodsport, Neutron, and Silver Banshee and the 1990s amassed an army of new threats like Conduit, Doomsday, Hank Henshaw, Maxima, Dominus, Rock, Baud, Barrage, Riot, and Anomaly. Some more recent additions include the General Zod of Russia, Lyla, Preus, Equus, Ignition, Imperiex, Ruin, Khyber, Manchester Black, Mercy Graves, and Livewire (the last two transitioning from Superman: The Animated Series). 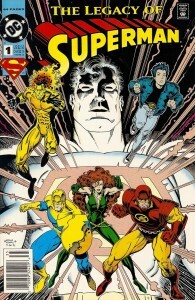 Writer Grant Morrison established in his story DC One Million that in the future, heroes went on to form dynasties on different planets, Superman taking residence on Earth whose nemesis was Solaris the Tyrant Sun. Superman’s supporting cast may best be described as a tale of three cities. The hero was born to the little rural town of Smallville, Kansas, which largely helped define the character as being raised in the center of the heartland, a traditional upbringing based in honesty, wholesomeness, and hardworking blue collar beliefs. 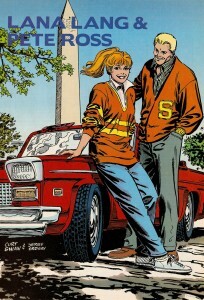 However, upon the creation of Superboy, it took on new life as a bedrock for Superman’s adventures as a young man, raised by parents Martha and Jonathan, going to school with childhood friends Pete Ross and Lana Lang (the latter becoming a rival for Superman’s affection with Lois Lane), assisted by scientist Professor Phineas Potter, and occasionally going to the future to hang out with the Legion of Super-Heroes. Superboy would even develop his own rogues gallery (Bizarro, Kryptonite Man, and General Zod and the Phantom Zone villains deriving from this group). Lang would become a heroine for a brief time, receiving a ring from a dying alien that allowed her to adopt the abilities of any insect or arachnid. Another would-be heroine appeared in the Yellow Peri, a girl who discovered a book of magic spells which generally resulted in her becoming a menace. The presence of the magic teddy bear-like imp Gazook that accompanied her only made matters worse. Lex Luthor would retroactively be placed in the setting, having the origin of his hatred tied to Superboy as Luthor was a scientist who befriended the hero and the pair would help each other. Everything changed when an experiment to cure Superboy’s weakness to Kryptonite caused a fire in Luthor’s laboratory, where the boy of steel tried saving his friend only to blow fumes from the burning chemicals in Luthor’s direction, costing him his hair (and arguably his sanity). Another city where Superman is known to visit is one he can embrace his alien culture denied him as a child in the Bottle City of Kandor. A city of Krypton shrunken and bottled by Brainiac, Superman would reclaim Kandor and spend years trying to reverse engineer Brainiac’s technology to restore it. Often he would shrink himself down to visit those within where he became an honored guest. He would also take to an identity of a futuristic Batman in Nightwing to fight crime in the city when necessary, taking a sidekick in Jimmy Olsen as Flamebird (as the city has an artificial red sun, Superman would lose his powers). Later, a scientist therein named Van-Zee would adopt Nightwing’s mantle with his assistant, former Phantom Zone criminal Ak-Var who served out his sentence, would become Flamebird (the pair sharing a striking resemblance to the original heroes). The city also housed the Superman Emergency Squad, a group of Kandorians who would monitor Superman and come to their mentor’s rescue if he was in danger or protect Earth if he was away (they have been known to wear copies of Superman’s costume). 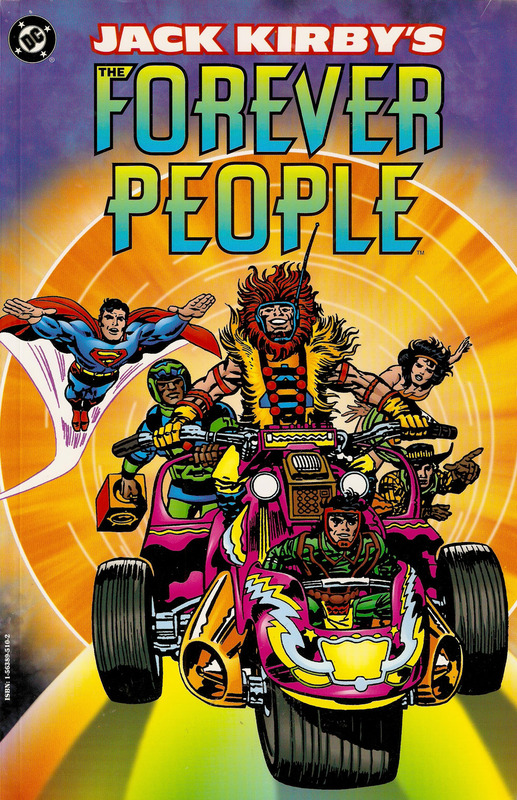 The group is led by Don-El, Superman’s cousin, and includes Van-Zee as a member. The city would also provide villains, two of whom became enemies of Supergirl in Black Flame and Lesla-Lar (the latter often tried to switch places with her). Superman would eventually discover how to return the city to normal size and did so on another planet, one that would be dubbed New Krypton (and later Rokyn). Superman would later construct an exact replica of Kandor as a bottle city for the Fortress of Solitude for sentimental value. Later, the hero would discover the city inhabited by tiny aliens who fled their doomed world and took refuge in the location, adopting the name of Kandor themselves. Following the Crisis on Infinite Earths, Kandor was reimagined as a bottle leading to an alternate dimension with a city collecting various different alien species to be used by the villainous wizard Tolos. The city was ruled by a council led by Cerimul where his son Ceritak, aka Scorn, would escape the city to become a hero in Metropolis (donning Superman’s costume when the hero’s powers became energy based). An alternative story for the city goes back to its Brainiac/Krypton roots albeit that it was a ghetto for alien refugees with some Kryptonians. Superman would learn time passed differently in Kandor as he would return to it years later to discover nearly a century had passed with a band of xenophobic Kryptonians led by a man named Preus would come to power praising Kal-El as their god. A non-Kryptonian telepath named Lyla (a homage to Lyla Lerrol) unwittingly called out to Superman to save them bringing the hero into the conflict. After Preus (and Lyla, who became corrupt after cloning Superman’s powers) were dealt with, Superman left and the Saturn Queen arrived with a brainwashed Ultraman to conquer the city (which prompted Power Girl and Supergirl, as Nightwing and Flamebird, to battle her, freeing Ultraman). 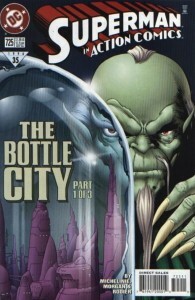 The bottle leading to the city would be destroyed by the post-Crisis Amalak who sought the demise of the Kryptonian race. 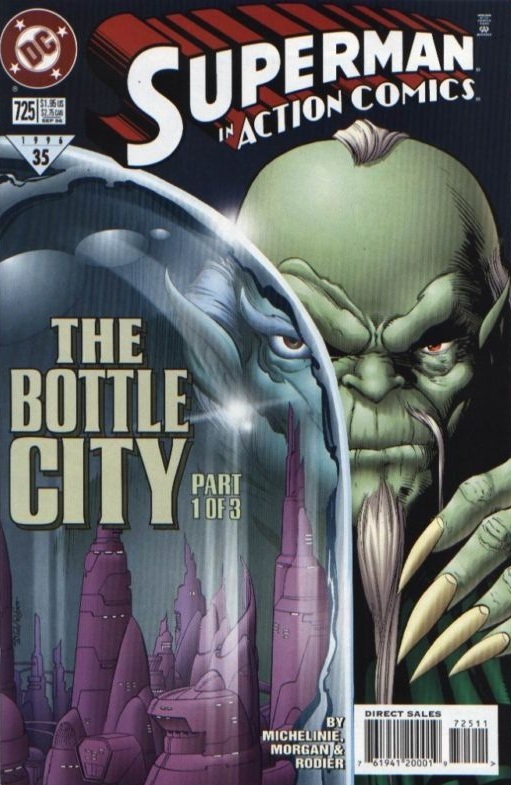 The Kandor more in line with the original would re-appear after Infinite Crisis again as a bottle city collected by Brainiac. This city would also include inhabitants of Argo City, Supergirl’s home city that survived Krypton’s destruction. Kandor, escaping Brainiac’s grasp, would grow to full size on Earth before being transplanted to its own planet in New Krypton running in the same rotation and position of the Earth but on the opposite side of the sun (similar to Marvel Comics’ Counter-Earth). The planet’s ruling council would release General Zod and his cohorts Ursa and Non from the Phantom Zone to assist in the planet’s defense and independence from Earth. Superman would move to the planet in order to experience life as a member of his people and to monitor the movements of Zod, in particular joining the military guild leading a unit known as Red Shard, taking on Asha Del-Nar as his second-in-command. Over the course of his experience, he would see the labor guild join the ruling council, represented by Tyr-Van, a spy Superman became close friends with. Yet another Nightwing and Flamebird would arise, this time in the form of Superman’s adopted son Chris (biological son of Zod and Ursa) as the former and childhood friend of Supergirl and religious acolyte Thara Ak-Var as the latter. Inevitably, Earth and New Krypton go to war and a tactic used by Lex Luthor kills most of the Kandorians. In the conflict, Flamebird perishes and Nightwing helps contain his biological father as prisoners of the Phantom Zone. Likely the greatest groundswell of characters to emerge from the Superman franchise is in his adopted home of Metropolis. As Clark Kent went to school for journalism at Metropolis University, he would meet and fall in love with the mermaid Lori Lemaris. 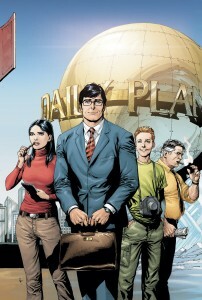 His move saw him join the Daily Star with George Taylor, Lois Lane, and Jimmy Olsen (for the Earth-One Superman, and those after him, the Daily Planet with Perry White in place of Taylor). Other, later, reporters include Cat Grant, Ron Troupe, Tana Moon, Steve Lombard, and Dirk Armstrong. 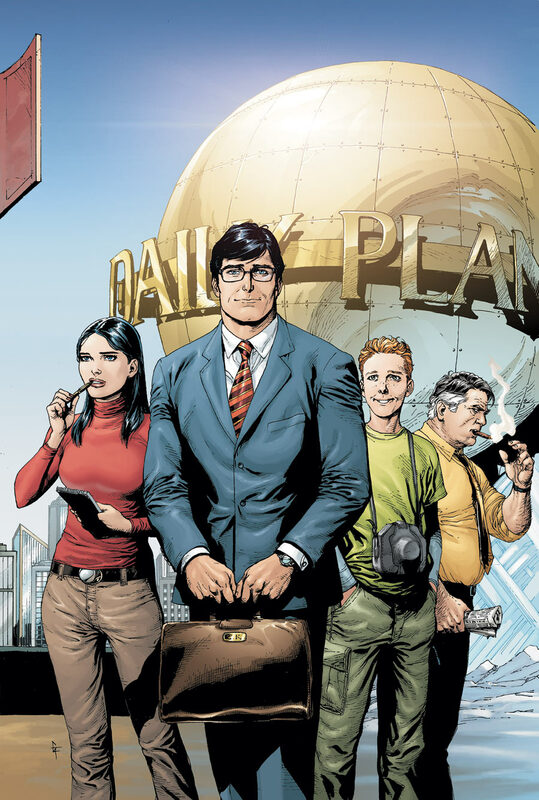 Clark Kent would even become a news anchor for Galaxy Broadcasting System when Morgan Edge bought the Planet in the 1970s (post-Crisis, Edge became an enemy of Superman). Other non-powered residents include bar owner Bibbo Bibbowski (Superman’s biggest fan), brilliant scientist Professor Emil Hamilton (Superman’s go-to science expert who became the supervillain Ruin), and the SCU (Metropolis’ Special Crimes Unit that handled superhuman crime). The SCU included Maggie Sawyer and Dan “Terrible” Turpin and would eventually create a metahuman division, due to the unending stream of supervillains, that included Freight-Train, Fireworks, Badmouth, and the Roo. The SCU would evolve into the Science Police after Sawyer transferred to Gotham and the apparent death of Turpin by Darkseid (the Science Police first appeared as part of the Legion of Super-Heroes franchise). 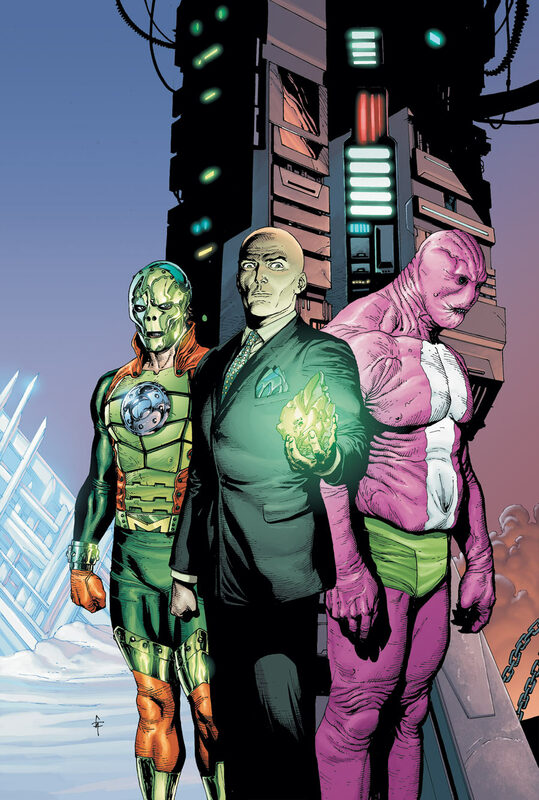 Organized crime is fairly rampant in Metropolis with dominant gangs like Intergang (led by Bruno “Ugly” Mannheim under orders from Darkseid) and the 100 (the prominent Metropolis branch led by Tobias Whale). The latter is notable for giving rise to the heroes Black Lightning, Halo, and the Thorn. Following the Crisis, the 1000 under the Director of Death would emerge in Metropolis battled often by Booster Gold. Another notable locale of Metropolis is Project Cadmus. Dedicated to the exploration of uncovering the secrets of DNA, lead scientist Dabney Donovan created a breed of non-humans called DNAliens patterned after monsters from horror films. Donovan would be ejected from the program when his experiments were uncovered and Intergang would establish their own version of Cadmus in the Evil Factory, a facility dedicated to creating soldiers for Darkseid headed up by Apokoliptian New Gods Simyan and Mokkari. Cadmus would be notable for producing Superboy, a hybrid of Superman and Lex Luthor’s DNA intended to replace Superman should he die but was secretly meant by Luthor to be a weapon. The Newsboy Legion, as adults, would become the leading scientists at Cadmus and clone their childhood hero and friend the Guardian and themselves with the intent of raising the latter as sons. Other notable products of Cadmus include Dubbilex and Auron (an empowered clone of Guardian). Another rival to Cadmus would emerge in the Agenda, which absorbed the Evil Factory, led by Lex Luthor’s wife Contessa Erica Alexandra Del Portenza and has a notable operative in Amanda Spence (daughter of former Cadmus director Paul Westfield where Spence blamed his demise on Superboy and got revenge by killing the hero’s girlfriend reporter Tana Moon). The Agenda would produce the Gene-Gnome, Match (a clone of Superboy), and the Point Men. Project Cadmus would largely be shut down when Codename: Assassin murdered those within the facility. Metropolis would be home to many of Earth’s heroes, as well. Some already noted include Jimmy Olsen (having been Flamebird, Elastic Lad, and Mr. Action), Earth-Two Insect Queen (an alternate version where Lana Lang received a scarab from her father where she could control and enlarge insects), Scorn, Chris Kent, Metahuman Metropolis Special Crimes Unit, Black Lightning, Halo, Thorn, Booster Gold (who would also become Supernova), Guardian, Newsboy Legion, and Auron. Others include Steel (where his niece headed up a new Infinity, Inc), Mon-El, Alpha Centurion, Traci 13, Gangbuster, Sinbad (who became Sharif in Los Angeles), Doctor Light, and the Supermen of America. Of course, not all of Superman’s supporting heroes necessarily came from Metropolis but would seek him out and often drop in from time to time. 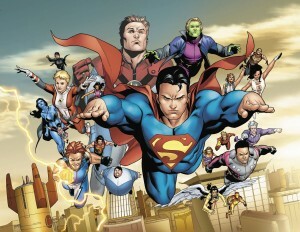 Some outside characters that visited include Eradicator, Kal Kent (Superman of the 853rd century), Superwoman (Kristin Wells), Power Girl, Maxima, Waverider, Cir-El, Strange Visitor, Vartox, Wonder Man (a Superman android predating Cyclotron and Kelex), Agent Liberty, Draaga, Icon, Mister Majestic, Ambush Bug, Garok, Halk Kar, and Captain Strong (retroactively, it was revealed the Manhunter from Mars would monitor the Man of Steel virtually since birth, assuming various identities to keep an eye on him). Several of these characters are alien beings and Superman has a long history of adventures in space where he often would befriend the heroes of other worlds. 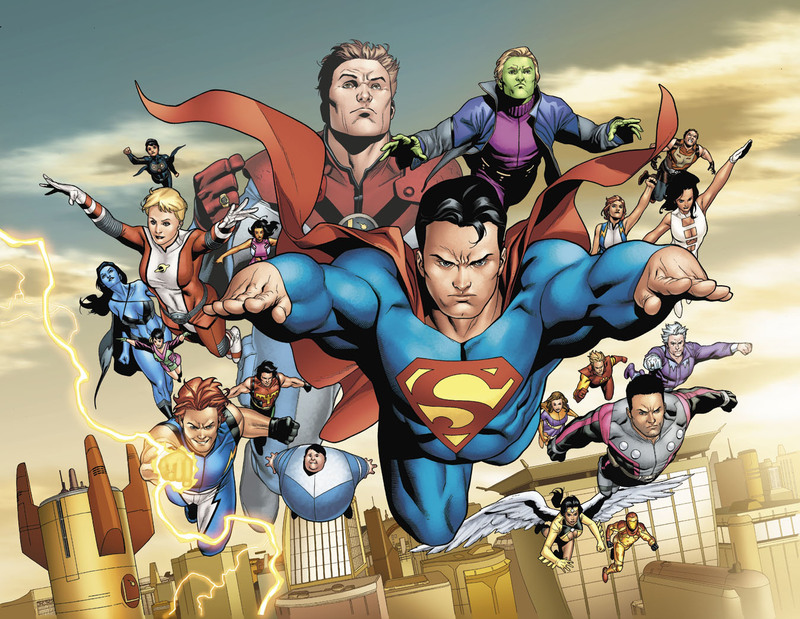 Such characters include Luma Lynai, Lyla Lerrol, Starman of the Infinite Realm, Quex-Ul (a Kryptonian Superman released from the Phantom Zone at the end of his sentence), Power Boy, the Hyper-Family, Hyper-Man, and Mighty Boy. Of course, it goes without saying there are two superheroes closer to Superman more so than others because they’re family. Superboy, as already stated, was a clone of Superman and Luthor that became the hero’s prodigy, splitting his time over the years between Metropolis, Hawaii, Happy Harbor, Smallville, and San Francisco. Supergirl was Superman’s cousin, her family having survived the calamity on Krypton as the heroine’s father (Superman’s uncle) Zor-El heeded his brother Jor-El’s warnings and convinced the elders of Argo City to begin measures to save itself. Constructing a dome over Argo, the city would drift through space unharmed in wake of the planet’s destruction. However, a number of years later the dome was pierced and its inhabitants threatened with annihilation leading Zor-El to rocket his daughter to Earth to join her cousin (Zor-El and his wife saved each other by retreating to a variation of the Phantom Zone). The post-Infinite Crisis story is similar but differs in that Brainiac discovers the city of Argo and transplants its people into the Bottle City of Kandor. The Supergirl of Earth-Two in Power Girl has similar origins to her predecessor but was rocketed to Earth at the same time as Superman in a slower vessel. Some of her enemies include Weaver, Force, Hurricane, Hydra, Pyro, Da Bomb, and Divine. Supergirl’s origins would significantly differ post-Crisis on Infinite Earths. During this period, Supergirl was re-imagined as Matrix, a protoplasm created by Lex Luthor on an alternate Earth with abilities similar to Martian Manhunter to battle three Kryptonians who had conquered the planet. Escapees from the Phantom Zone, General Zod, Faora, and Quex-Ul defeated this Supergirl who then went to the main Earth to request Superman’s aid. 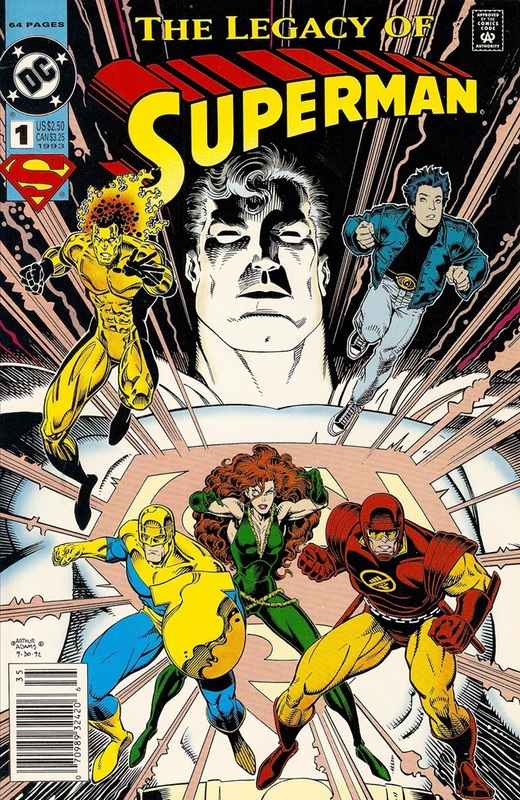 Superman would return and use gold Kryptonite to remove the villains’ powers, though they claimed they would find a means to regain them and seek their revenge on the hero’s Earth. As the trio had murdered all the people on Matrix’s world, Superman killed the three with green Kryptonite. Alone, Matrix returned with Superman as Supergirl. Matrix would later merge with a dying human named Linda Danvers (Supergirl’s pre-Crisis secret identity), split into two where one half merged with the Earth Angel of Light Blithe and the other half lost Linda and merged with an Angel of Fire named Twilight. Over the years, the various Supergirls would accrue various enemies. Some earlier villains include Black Flame, Lesla-Lar, Nasthalia Luthor (Lex’s niece), and Princess Tlaca. When Supergirl moved to Chicago, she made enemies of Blackstarr, Decay, Psi, Reactron, and the Council (including the Director, Matrix-Prime, and the Gang). 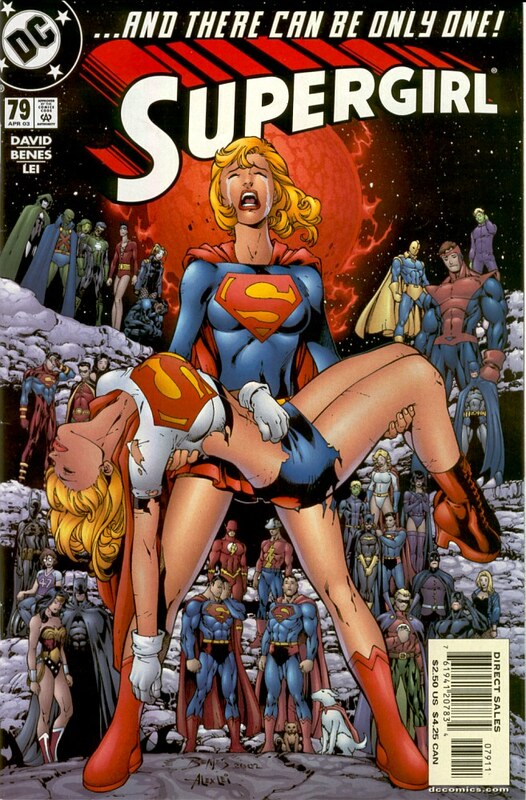 The post-Crisis Supergirl fought Blithe, Buzz, Carnivore, Lilith, Murmur, and Twilight. 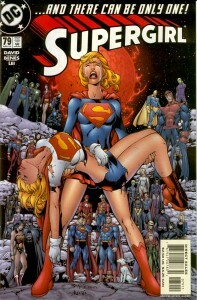 Post-Infinite Crisis Supergirl would frequently battle Lois Lane’s sister Lucy as the villainous Superwoman. Also along the lines of alien encounters, there’s the previous alluded to Legion of Super-Heroes. A trio of teens of the United Planets journeyed to the past to recruit Superboy for their team of heroes, having been inspired by the youth. This exchange would begin a longstanding relationship as the Legion of Super-Heroes lived up to its name with dozens of members, including Supergirl and Mon-El (the latter a Daxamite, a similar race to Kryptonian, that suffered amnesia and believed himself to be Superboy’s brother and would be trapped in the Phantom Zone for hundreds of years after suffering lead poisoning). The introduction of the Legion opened an entire new world to explore and a monster franchise for DC Comics. In addition to the massive ranks, there were various supporting characters like the Science Police (notably Shvaughn Erin), Legion of Substitute-Heroes, Heroes of Lallor, Wanderers, Dev-Em, Kid Psycho, and Green Lantern Rond Vidar. Of course, it would also open the door for dozens of villainous enemies like the Fatal Five, Mordru, Time Trapper, Computo, Legion of Super-Villains, Khunds, Doctor Regulus, Dark Circle, Dominators, Pulsar Stargrave, Universo, League of Super-Assassins, Controller, Grimbor the Chainsman, Starfinger, Black Mace, and Legion of Super-Rejects. As with everything else at DC Comics, the Legion would go through various reboots which prompted new stories, members, and enemies (as well as allies, such as the Uncanny Amazers of Xanthu and the Workforce). Following Infinite Crisis, these various alterations of the Legion would meet and interact with each other. The Legion would get their own animated series in 2006. A modern day branch of the Legion of Super-Heroes would emerge as the Legion of Super-Pets. Superman family members Krypto the Super-Dog (Superman’s boyhood dog), Streaky the Supercat (Supergirl’s pet), Comet the Super-Horse (Supergirl’s magic steed), and Beppo the Super-Monkey (Jor-El’s test subject that stowed away on Kal-El’s rocket) were brought together by the Legion across time when Superboy was captured by the Brain-Globes of Rambat who could enslave the minds of humans but not other animals. 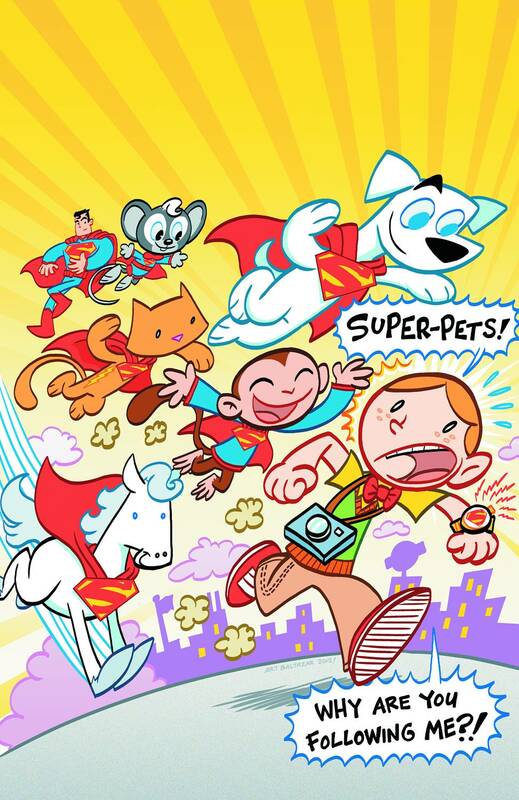 The group would save Superboy and occasionally return, joined by Chameleon Boy’s pets Proty and Proty II (Robot Chicken would parody the group adding their own creation Hissy the Super-Snake). 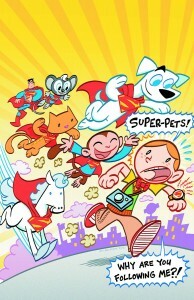 Other Superman family animals include Yango the Super-Ape and Streaky’s telepathic descendant Whizzy. The group would later emerge in the pages of DC Super Friends incorporating other heroes’ pets in Batman’s dog Ace the Bat-Hound, Wonder Woman’s kangaroo Jumpa, and Aquaman’s octopus Topo led by the Green Lantern Ch’p (this appearance led to the DC Super Pets franchise that added Green Lantern B’dg, Gleek, Storm, Whatzit!, and Hoppy the Marvel Bunny as the Legion moved on to Superman Family Adventures adding Fuzzy the Krypto Mouse). Krypto would also join a group of other empowered dogs in the Space Canine Patrol Agents that would be adapted for the Krypto the Superdog television series as the Dog Star Patrol (in the comics, there was also a feline variation in the Space Cat Patrol Agents). 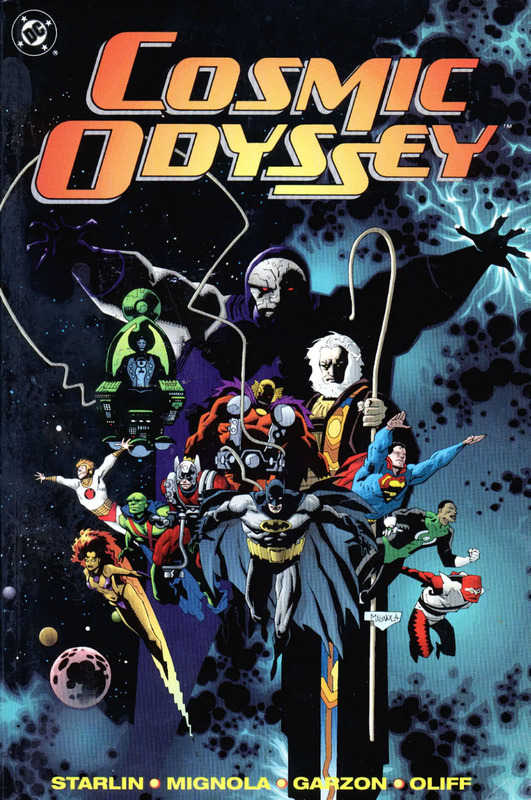 Arguably the biggest contribution spinning out of the Superman family of titles into its own franchise is the New Gods. The characters are likely Jack “the King” Kirby’s greatest contribution to DC Comics and one of his seminal works in comic books, a career highlighted by co-creating the likes of Captain America, Fantastic Four, Hulk, and the X-Men. The New Gods were brought about in the Fourth World metaseries spanning Superman’s Pal Jimmy Olsen, Forever People, New Gods, and Mister Miracle. Each series was its own unique entity but had an overall theme. 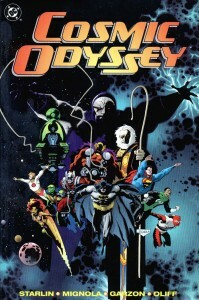 Within Jimmy Olsen, Superman has to contend with the emerging Intergang, a group of gangsters outfitted with alien technology seeking the Anti-Life Equation (some formula that provides various miraculous capabilities such as enslaving the minds of those that hear it) for Darkseid, ruler of the fiery planet Apokolips, on Earth. 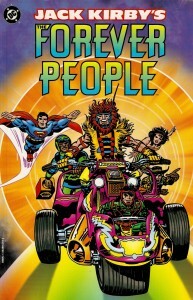 The Forever People are a group of young New Gods from Supertown of New Genesis (ancient enemy of Apokolips) brought to Earth to save one of their own where they would often visit from then on. In times of great need, they can switch places with the powerful Infinity Man to battle evil in their stead. The New Gods dealt with the real meat and bones of the overall story, revealing the ongoing struggle between Apokolips and New Genesis resolved, at least for a time, when the rulers of the dueling worlds exchanged sons. Izaya the Highfather of New Genesis would take the war-born Orion as Darkseid accepted Scott Free. Izaya would try to help Orion combat the ugliness and anger in his heart while the child would become the greatest warrior in all of New Genesis with New Gods largely relating his tale. The other child, Scott Free, would star in the self-titled series Mister Miracle, cast into Granny Goodness’ Terror Orphanage by Darkseid where the children of Apokolips are transformed into sadistic soldiers in their dark ruler’s service. Free would combat the facility’s training and mutually fall in love with Big Barda, captain of the elite Female Furies. Barda would help Free escape Apokolips towards Earth joining him shortly afterward (the former awaited by Darkseid as the act nullified the truce between the two worlds). On Earth, Free studied under the circus escape artist Mister Miracle and inherited his identity (as well as his assistant and friend Oberon). In time, Darkseid became the most prominent villain at DC Comics (and a contender for Superman’s nemesis, a position long held by Luthor). 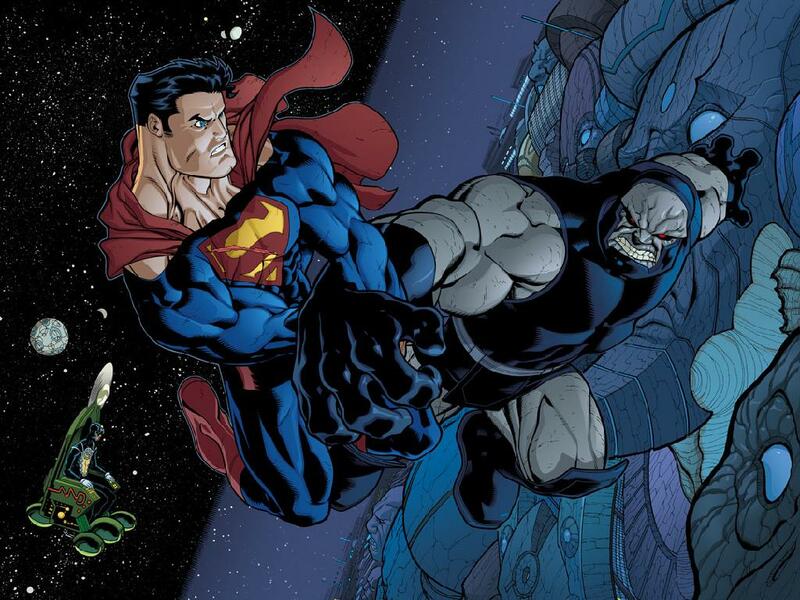 As the Teen Titans and X-Men crossed over, Darkseid would be one of the primary antagonists. When the Super Friends returned to television for two final seasons, Darkseid was the featured villain. The New Gods would be prominent in the toyline that accompanied the cartoon in Super Powers. 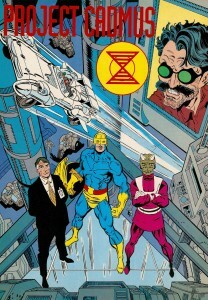 As DC Comics rebooted its line with Crisis on Infinite Earths, the publisher would follow it up with Legends which saw Darkseid try to turn the people of Earth against its heroes. Since then, Darkseid would emerge repeatedly in stories like Final Crisis and the initial arc of the post-Flashpoint Justice League series. Darkseid also battled the Legion of Super-Heroes in what many consider the greatest story of the team in the Great Darkness Saga. Outside of comics, beyond his Super Friends appearances, Darkseid would emerge in virtually every media appearance that included the Justice League. In the current series Young Justice: Invasion, it is heavily implied Apokolips is significantly involved with the series antagonists.